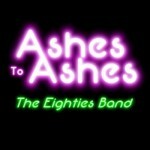 We are thrilled to showcase the talent of local band ‘Ashes to Ashes‘ on the main stage at Plymouth Pride on Saturday 13th August 2016. Ashes To Ashes will take you on an energetic trip through the music of the 80’s an important time in history for the UK and international ‘Pride Movement’. View the Plymouth Pride 2016 page for more news about acts, activities and supporting events that makes the Plymouth Pride Festival.